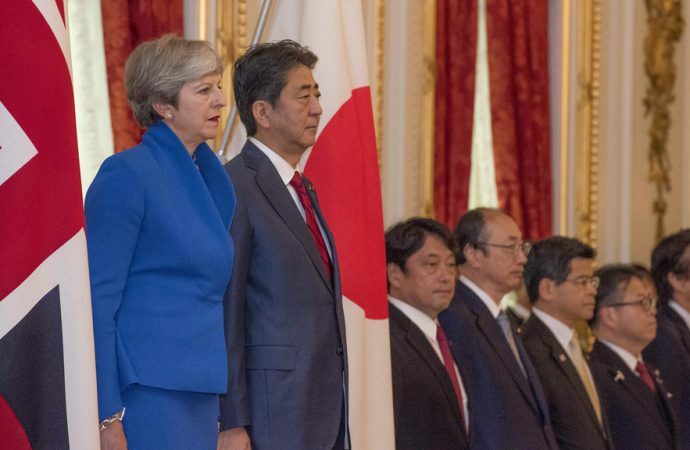 Japanese Prime Minister Shinzo Abe’s January 2019 visit to the United Kingdom highlights the close partnership that exists between the two great powers. As the U.K. attempts to redefine its role on the international stage once it withdraws from the European Union, London will move to embrace old allies and new partners in an attempt to forge stronger ties to emerging markets in the East. The relationship between Japan and the United Kingdom has the potential to be of enormous mutual benefit to both parties. The two are both fiercely proud island nations with considerable geopolitical clout. In a recently published audit of global geopolitical capability by the Henry Jackson Society, the U.K. was ranked second only to the United States, with Japan being ranked sixth. The study defined the U.K. as a global power, and Japan, despite being the third-largest economy worldwide, is described as a “hemispheric power,” meaning that it has the geopolitical capability to wield influence within the northern hemisphere. Relations between the Japanese and British began over 400 years ago. The Anglo-Japanese partnership was solidified in 1854 with the signing of the Treaty of Friendship and Trade. The treaty defined the relationship between the two countries as one centered around mutually beneficial commerce and security. After relations improved following the end of World War II, trade and security once again became the foundation blocks upon which the Anglo-Japanese relationship was built. Abe’s visit was, by no means, coincidental in timing. Abe intended to provide reassurances to both British businesses and undecided politicians over British Prime Minister Theresa May’s Brexit deal. Specifically, Abe made the case that May’s deal is the best option for Japanese businesses who rely on the United Kingdom’s access to the European single market. Japanese investment in the U.K. reached £46.5 billion in 2016, with over 1,000 Japanese businesses employing over 150,000 people. The Japanese automobile manufacturers Nissan, Honda, and Toyota produce nearly half of the 1.67 million cars assembled every year in the U.K., of which the vast majority are exported. As the British auto industry employs just-in-time manufacturing processes, any future E.U. tariffs and border delays will have a negative impact on the industry. Japan has long-relied on the U.K. as its gateway to Europe. While access to the single market may be reduced once Britain leaves the Union, there are still advantages for businesses operating in the U.K. A growing labor market and a highly skilled manufacturing base, technological prowess in research and development (ranked second in the world after the U.S.), stable trade relations, and the status of the English language as a lingua franca for international business and diplomacy are all significant factors in attracting and maintaining Japanese interest and investment. Prime Minister Abe’s other key message for the U.K. is one intended to convey Japan’s desire for increased defense and security cooperation. Abe stated that the two nations are “partners as we strive to uphold rules-based international order and to promote global and regional security.” Abe’s statement follows significant developments in bilateral defense cooperation over the past 18 months. This meeting between the two heads of government resulted in the Japan-U.K. Joint Declaration on Security Cooperation, an agreement which seeks to further bilateral engagement on security issues including counter-terrorism, counter-piracy, and cybersecurity. Securing international sea lanes throughout the Indo-Pacific region from foreign aggression is another key objective, as is increasing participation in international peacekeeping operations. The declaration established the conditions for Japan, which has been reluctant to develop offensive military capabilities after the Second World War, to increase its regional military engagement. Furthermore, the agreement set the stage for unprecedented levels of Anglo-Japanese defense cooperation throughout 2018. In a demonstration of a “Global Britain” approach to foreign policy, the Royal Navy deployed three ships to Japan: the HMS Albion, Sutherland, and Argyll. The deployed ships supported a variety of missions, including enforcing United Nations sanctions against North Korea, conducting freedom of navigation operations (FONOPS), and participating in joint exercises with the Japanese Maritime Self-Defense Force. The deployment significantly improved interoperability between the Royal Navy and the U.K.’s closest ally in Asia. Additionally, British Army personnel from the Honorable Artillery Company participated in exercises on Japanese soil alongside their Japanese counterparts for the first time, the only foreign military forces to do so alongside the U.S.
At a strategic level, these actions demonstrated the U.K.’s commitment to regional stability, international law, and the United Nations Law of the Sea; crucial components to the maintenance of a rules-based global system and essential to countering Chinese subversion and expansion across the region. 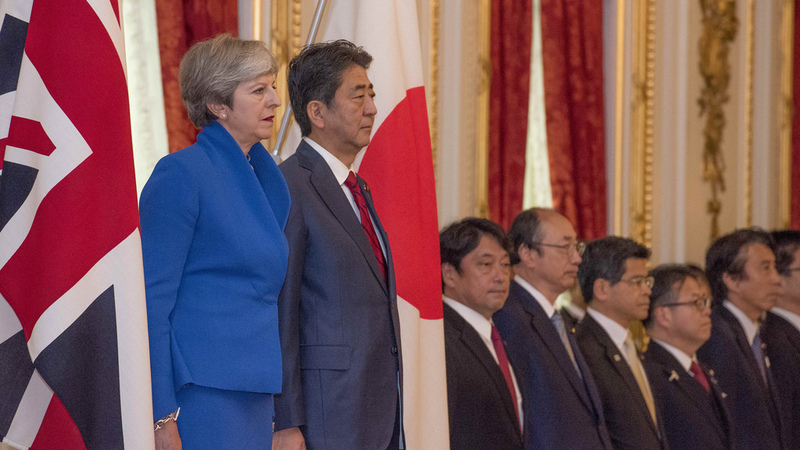 Growing bilateral defense cooperation between the U.K. and Japan demonstrates that the relationship is more than one based solely on national interests, instead, it is one of a higher strategic significance. As the U.K. prepares to leave the European Union, it is evident that trade is foremost amongst Japanese concerns. Considering the level of Japanese investment into British industry over the last forty years, this is understandable. However, once the U.K. has formally left the Union, engagement with allies like Japan should be the highest priority. A Global Britain approach to foreign policy seeks to maximize the United Kingdom’s geopolitical capabilities as a global power. To do this, the U.K. must be seen as upholding the core values and standards of the rules-based global order. The U.K. can sustain its geopolitical capabilities while strengthening British influence around the world by reinforcing strategic partnerships with powerful allies like Japan while seeking out new opportunities for cooperation and engagement. Failure to do so would be detrimental to both British economic interests and overall global security.